Dr. Lugar graduated from Auburn University Veterinary School in 1988 and built the New Georgia Animal Hospital with her husband, Billy. They have two children, Will, who is currently living and working in Chicago and Cassie, a freshman at Kennesaw State University. The New Georgia Animal Hospital began as a small renovated home serving the community of New Georgia and Paulding County in 1997. Dr. Lugar has been named Veterinarian of the Year by the Georgia Humane Society and is an active volunteer in her church and community. Her favorite hobbies are knitting, sewing and power walking. Pictured above with Dr. Lugar is Emmett, one of her favorite barn cats. She has a wonderful three-legged lab named Luke, her daughter’s horse, Penny, our miniature donkey, Ellie, plus lots of fresh eggs from the chickens that keep everyone busy on the Lugar farm. Dr. Alexander joined the practice in January of 2017. She is a Cartersville GA native but is now proud to call Dallas her home. She earned her Bachelor of Science degree in Biology from the University of Georgia and her Doctorate of Veterinary Medicine from the University of Georgia College of Veterinary Medicine in 2016. She is a member of the AVMA and GVMA .Dr. Alexander is married to her husband Seth and their family consists of 2 Aussies, a yellow lab, a cat, a horse and even a cute little mini pig named Pearl. Dr. Alexander has been a wonderful addition to our New Georgia family and enjoys making a difference in people’s lives by caring for and helping their pets. Candace started at the New Georgia Animal Hospital in June, 2006 as a Kennel Technician while still in high school. She has worked her way up to Receptionist and Veterinary Technician and is a valuable member of our staff. Always with a smile on her face, Candace is known to all as the “staff jokester”. Her daughter, Aubrie, is the love of her life along with her husband, Matt, 2 cats, Shimi and Meko. Though Candace has a wonderful way with clients, her favorite part of her job is being able to interact with all of the wonderful pets our clients bring in. And much to her cats’ delight, her favorite hobby is fishing! 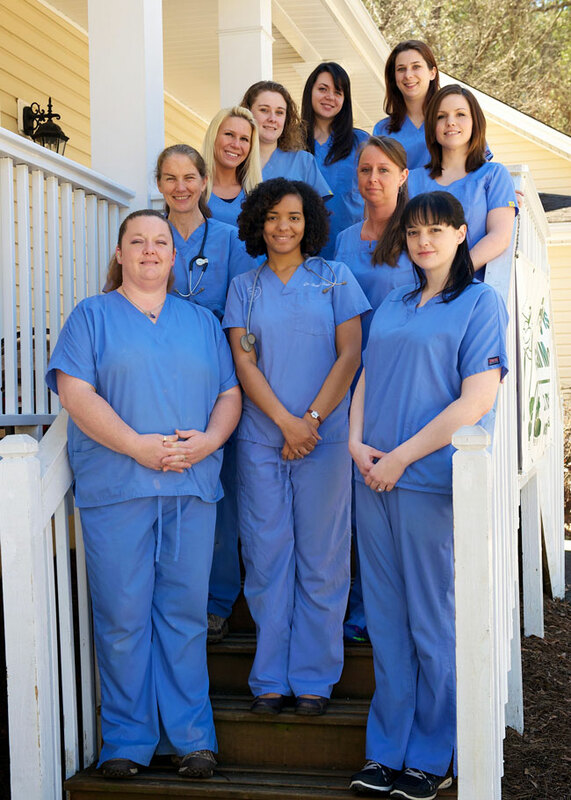 Amanda has been with the New Georgia Animal Hospital as a veterinary technician since July of 2007 and is so valuable to the success and quality of the care we offer our clients and their pets. She is married to Coye and has two children, Billy and Ashley. Amanda’s passion in life is being around and caring for animals of all kinds which includes her own six dogs that fill her household. Always with a smile on her face, Amanda enjoys walking, gardening and being outdoors. Dr. Lugar considers her the heart and soul of the practice. Liz started at The New Georgia Animal Hospital back in November of 2007 as our in-house Groomer. She has been grooming and pampering clients’ pets for the past 13 years and would love to show off her skills with your pet. Liz is married to Chris Davis and has quite a menagerie of animals at her house including two dogs, Maggie and JD and her cats, Connor and Seamus. Her children, Hagan and Roxie, round out the complete household and naturally spending time with her family is her favorite thing to do. Adrienne joined us in January of 2010 working in the kennel and later as a Veterinary Assistant. She is married to Conor Higginbotham and has two children, Brandon and Bryce. When you visit the clinic you will probably find Adrienne in the kennel doing what she loves best, giving baths to all of the wonderful animals. And when she finally heads home she is greeted by her own pets, Jade, a lab/chow mix and two cats, Taz and Tigress. Adrienne loves playing board games and spending time with her family. Kimberly has served as one of our Receptionists since 2012 and specializes in learning as much as she can about our clients’ pets and their endless pet stories. This is her way of personalizing customer service and providing a comfortable experience for owners and their pets. Kimberly loves spending her leisure time with her husband and family, reading, cooking and watching movies. Her four cats, Tum-Tum, Zen, Sookie and Cheezy fill up the rest of her free time. Kimberly also has a Bachelor of Science degree in marketing. Kelley Ann has been with The New Georgia Animal Hospital since December of 2015. She has been grooming pets for over 19 years and is a wonderful addition to our staff. Her goal is to make your pets feel stylistic and proud of their new do's. Kelley Ann has a very sweet son, Ethan, who has inherited his mom's love of animals. They have two cats, Tobey and Orangie, as well as two dogs, Sophie and Jake. She is married to Chuck Buckner and when she is not pampering your pets or playng with her own darlings, Kelley Ann enjoys yard sale shopping with Ethan in hopes to find old treasures.